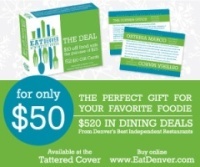 In my personal opinion, the Denver dining scene has matured immensely over the past handful of years. As I mention that fact, many of you are already chalking up your thoughts of the who, what, when, where and why of this revolution. And chances are if you're reading up on this blog, you're interested in figuring out who a couple more of these folks are in the here and now. I feel that no matter when this collection begins, there will be always be plenty of dining experiences of yesterday and tomorrow to discuss. No better time to start than now, but know that I will be playing "a little catch up" with some of my recent favorites (and least favorites). Now even though 'The Denver Dish' suggests a rather finite geographic locale, of course this collection will encompass a greater area that has captured both the art of cuisine and the attention of my gorgeous wife and I. This could include the Flatiron-backdropped Pearl Street of Boulder, or the suburb charm of Littleton. And of course as we travel, there might be a few gems abroad that would be worthy of noting. So there's the background of the current venture. Moving on, not only do I feel I will never escape the lothargia of last weeks' Denver Restaurant Week marathon, but on top of that I have too many comments flying through my head to not write them down. I do not plan for this blog to be a venting mechanism for my hypercritical dining tastes, but if you have dined with me since I graduated Johnson & Wales University two years ago, you know that when I eat, I talk just as much. In fact, a few of these dining companions encouraged me to start this blog; probably in hopes that I would learn to shut my mouth when I'm talking, keep my opinions to my keyboard and let them eat in peace. Naturally the opposite will probably happen. Enter my goal in continuing forth on this. My main hope is that perhaps the thoughts that flood my mind as I'm stuffing my face will be helpful to others thinking of hitting the town and doing the same thing. Hopefully this can be a first stop in the series of many for you. Thanks for reading this far, I would love to hear your comments and suggestions. Dish it up Denver! I found The Denver Dish via Future Gringo and have added a link from www.culinary-colorado.com, but I do wonder who/where you are. You write in first-person singular but a hint as to who "I" might be would be welcome. I am a Denver native and currently live in Capitol Hill with my wife Jessica. I attended Johnson & Wales for a Culinary Arts and Foodservice Management degree, and have worked in the restaurant industry for 15+ years, currently working with Red Robin Gourmet Burgers.